WOOD FIRED BRICK OVEN BURGERS "TAKE II"
After trying burgers in my Roundboy Oven and being unsuccessful I wasn't going to try again right away. 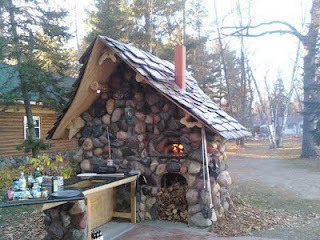 Until I received an email from Jed at Coney Island Catering to try using frozen burgers in the wood fired oven. 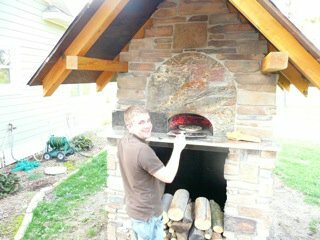 Jed, a young entrepreneur, visited us last summer and gave me all the tricks to wood fired pizza. 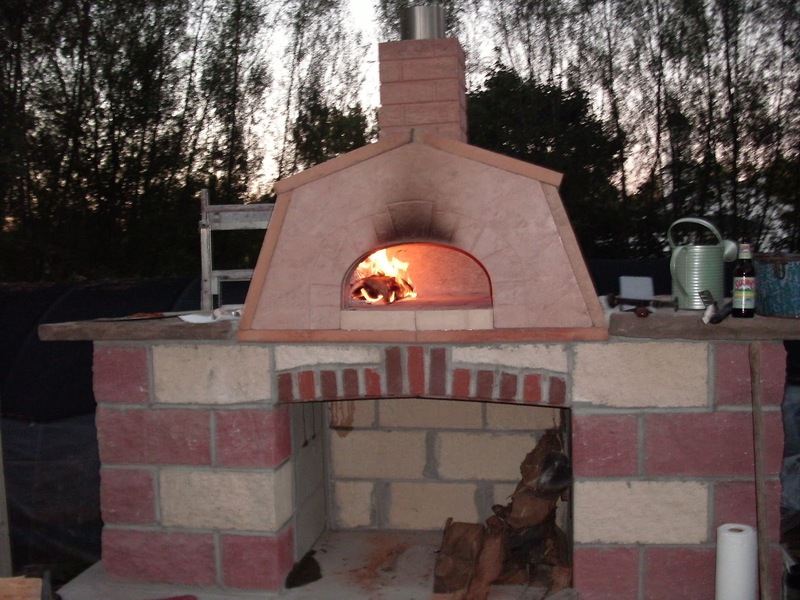 He purchased a Roundboy as a second oven to use when catering parties for his already successful wood fired pizza business in New Jersey. I knew the frozen burger trick would be just what I needed to make wood fired burgers. Tonight's Menu: Burgers, Mac and Cheese and Blueberry Cobbler. Karl let the fire burn down to hot coals. He put the grate in the oven to heat and then we added the frozen hamburg patties. We placed the prepared Mac and Cheese in the front of the oven. I always start my Mac and Cheese recipe with heavy cream, Velveeta and butter. I then add what ever cheese I have on hand. Tonight I added Boar's Head Vermont Cheddar and Cracker Barrel extra sharp. Frozen hamburger patties were the trick! The Blueberry Cobbler was made with blueberries from our blueberry patch, the last bag picked and frozen last summer. Apple Joe stopped by just in time to try the cobbler and he really liked the blueberries. The wood fired pizza oven is ideal for fruit desserts. One final comment. I have a slightly used gas grill for sale! This weekend will be a busy one for us. We are moving Amanda into her new apartment and we want to get a little yard work done. This rain everyday for the entire spring has made it hard to accomplish anything outside. I am hoping to have our friends over for a holiday party rain or shine! That is the best part of our barn because it is a great place when the rain tries to ruin a party. I am thinking we will make ribs in our Roundboy oven. As I was searching for a new rib recipe I started to wonder what our customers will be making in their Rounboy oven. This led me to think about all the ovens we have sold. Some of the places I can think of are Tennessee, Ohio, Pennsylvania, Texas, California, The Bahamas, Florida, Virginia, Minnesota, New York, Massachusetts, Canada, Arizona, North Carolina and Connecticut. I know I am missing some places and if I forgot you let me know! We have talked to chefs, happy parents building a surprise outdoor kitchen for their just married child, a Boy Scout leader buying an oven for the Boy Scout camp, owners of a tea room buying the oven for their garden, wives surprising their husbands, vacationers for their lake home, creative homeowners who turned their oven into a beautiful gnome house with stone work that matched their own home, pizza lovers and bread bakers. 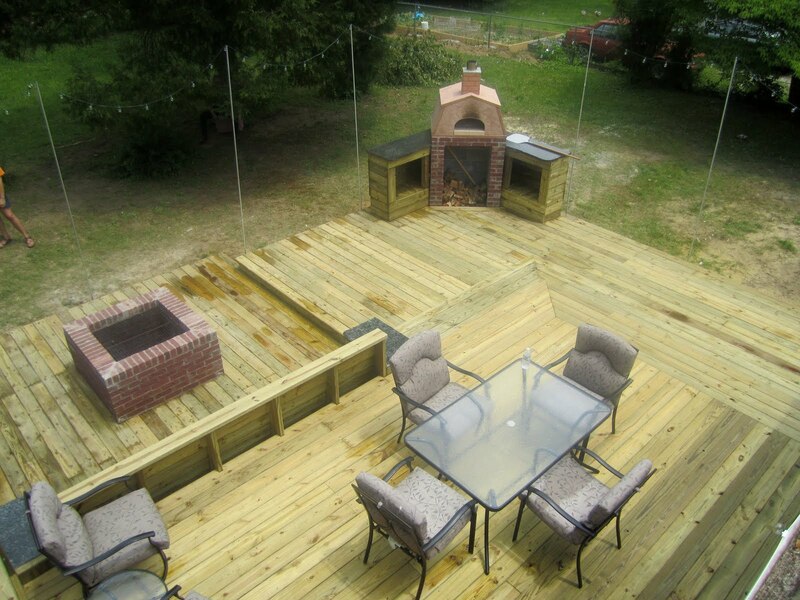 They have sent us pictures of their outdoor kitchens and their first fire and first pizza! We have enjoyed everyone we met and talked to and feel like we have new friends. For me the thought of selling something and connecting with someone in all these places is not something I ever thought would happen in my life. Karl and I are hometown people. Harry and Chrissy live on a lake and none of us travel. 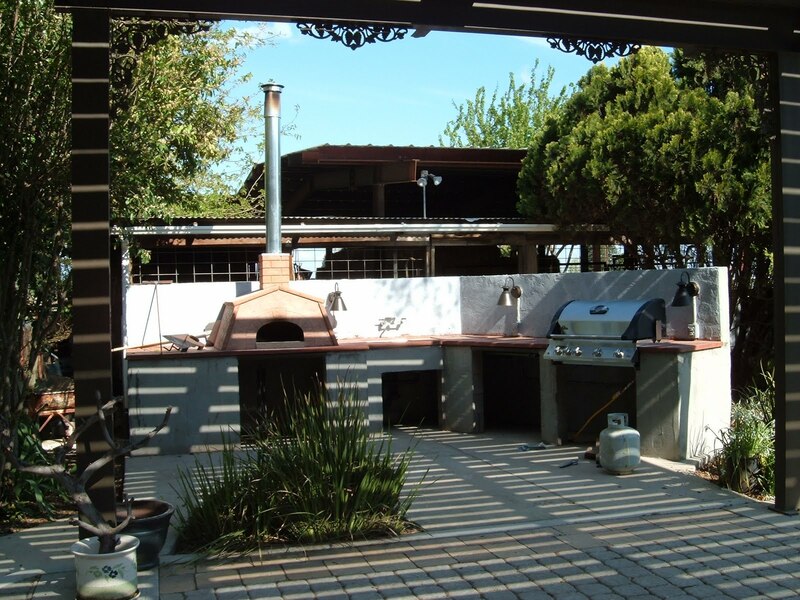 We enjoy our backyards and we enjoyed staycations long before they became popular. I think our hometown has just grown and it is bigger than our backyard! 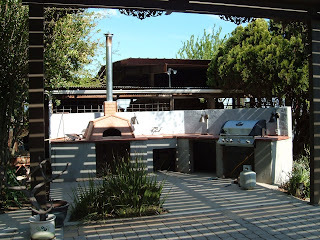 So I will share some pictures with you and I would love to know what my friends all over are cooking in their Roundboy oven for Memorial Day. Karl and I took our usual Sunday morning gator ride around our property today. He went over all the improvements he would like us to make to the front of our yard and we checked out the blue berry patch. As we looked at the yard we talked about Amanda and her graduation yesterday, we are both so proud of her! We had a great day and a wonderful dinner at Damenti's with both kids. Saturday morning Karl, Harry and K.C. had a meeting with an advertising and marketing company for some help keeping Roundboy Ovens growing strong. It seems that lately in my house there are a lot of new beginnings. I am having fun helping Amanda set up her new apartment and get ready for her new job and a new beginning to her life. When you children move on and out it is a new beginning for parents also. Sometimes that has been scary for me but lately Karl and I are really enjoying it. We are proud but also we enjoy our kids as adults and enjoy some freedom for ourselves. Starting a new business and enjoying the oven has been a real good experience for us. I think when you enjoy the product you sell and enjoy meeting new people you can't help but to be a success! That brings me to brick oven lasagna, we went out for a first class dinner for Amanda's graduation. Damenti's is one of our favorite places and yet both kids and Karl could not wait to make pizza on Sunday! I was the one who enjoyed the dinner out the most because I had a break from cooking. So pizza it was on Sunday before K.C. went back to New Jersey. We had our usual favorite pies but as I was buying the things I needed I kept thinking what could I use the left over toppings and cheese for. I always have too much toppings and not enough dough. I decided to make lasagna and add the sausage, mushrooms, cheese, tomatoes sauce and wine that was left over into the lasagna. I would of course bake it in our Roundboy oven! I made my sauce, noodles and cheese mix up but put the lasagna together after we were done with the pizza. I just added the left over toppings right in. It was delicious and easy. Dinner solved for Monday night! Some landscaping around the waterfall and remove the fence before Amanda talks us into another horse or two. A new spot for our Roundboy oven. I want it close to the barn for parties. Slicing the mozzarella cheese instead of the shredding side worked perfect. When the cheese is shredded it is too fine and melts fast. when I hand slice it the cheese melts too slow. This side of the grater worked perfect! The oven was nice and hot from baking pizza. Karl took the fire out and left a few hot coals. He put the lasagna in and the door on the oven. He turned if after 30 min. and the lasagna was done after 30 min. more. I saved a little wine before dinner for the lasagna because at our house there is never some left over wine! When Karl asked if I wanted to try burgers in our Roundboy Oven my first thought was there goes the last thing left to use our Weber Grill for. We tried out burgers in the brick oven tonight! I think I will keep my grill for now. The burgers cooked too fast and came out very dry. I would like to try again in the future. The oven needs to cool down next time and fewer hot coals under the grate would be better. It was a great learning experience and I could have not written a post about it, but it is important to share our actual outcome with the oven and everything we make. I am not sure if it was just one of those days when everything you touch turns to ..... But all was not lost! I also made Andrea Mugnaini's Tuscan-Style Rustic Apple Cake. She says in her book that the high, moist heat of the wood fired brick oven is ideal for the caramelization of the sugars in the fruit. I must say she is right! I have made her Cherry Clafouti and now the Apple Cake and both were easy and delicious. I am a big dessert fan and it was ok in the end that we had dessert for dinner! I guess when life gives you lemons (or apples), make dessert. We turned the cake after 10 minutes and it was done in 20 minutes. I sprinkled powder sugar over the top. I am sorry if you have tried to find my blog and could not. My blog has been lost for the past week! Due to technical difficulties (a stupid mistake I made and it took countless hours to correct) the blog was out there but under a different domain name! I think there may still be a few problems left that will work out as I continue to blog. You can find my blog at blog.roundboyovens.com and we are linked to our Ebay listing once again! You can still contact Karl on his new iPhone at 570-885-3269 as he is having a much easier time using his new smart phone then I have had this week with domain names and my laptop!